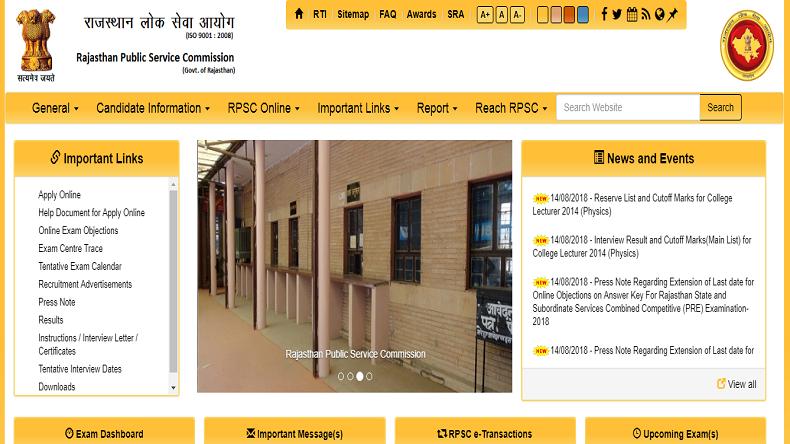 Rajasthan Public Service Commission (RPSC) has closed the link for submission of objections on the answer keys of RSMSSB Combined Competitive Preliminary Exam 2018 on its official website. Candidates can keep an eye on the website as the result for the same will also be declared soon. The RSMSSB Combined Competitive Preliminary Exam 2018 was conducted on August 5, 2018, at various centres across the state and the answer key was released on the official website recently. According to latest reports, the Rajasthan Public Service Commission (RPSC) has closed the link for submission of objections yesterday, which was earlier scheduled to be closed on August 13, 2018 and the result will be soon announced through the official website. However, the Commission has not yet made any official announcement regarding the declaration of the results yet. Meanwhile, those candidates who had failed to submit their objections on their answer keys will not be able to raise any objection as it has already been closed on the official website of the RPSC. The results for the RSMSSB Combined Competitive Preliminary Exam will be declared on the official website, rsmssb.rajasthan.gov.in. soon. Candidates eagerly waiting for the result can check the steps to download RSMSSB Combined Competitive Preliminary Exam result 2018 given here. How to download RSMSSB Combined Competitive Preliminary Exam result 2018?